You can do all the right things to protect your car from cosmetic damage, but each car can still experience wear and tear. If you find your paint job is chipped or scratched on your car, you want to touch that up before it gets worse. Learn how to touch up your car’s paint with a few helpful tips. Why Touch Up Your Car’s Paint? Paint chipping on your car may seem like a simple cosmetic issue, but surface damage to your car can lead to much bigger problems. A paint chip can cause exposure to the elements, which can lead to rust on your car. Avoid having to deal with rust by keeping your car’s paint surface intact. The amount of paint you need will depend on how much you want to cover. Simple touch ups on your car’s paint job can be done on your own with a few tools and a little time. Supplies you will want for your DIY paint touch ups include sandpaper, soap to wash your car, paint primer, paint, and clearcoat. Different touch up paint jobs will need varying amounts of paint and paint applicators. A paint pen can take care of small paint touch ups. Most people opt for an aerosol spray paint can in order to get a clean layer of paint, especially if the paint needs to cover a large surface area. Blend the old and new paint colors together by fading the new color on surrounding panels. When you fix your car’s paint, you want to have as close to an exact match on paint color as possible to make the repair not look too obvious. You can often find information about your car’s paint on a sticker usually placed on a door of the car. This sticker will list the paint code and other information that can help you get a closer match. You and your car have braved the elements together. If there has been some fading, your best option for a paint match will be visiting an auto body repair shop. The trained automotive technicians at Liberty Collision will take the paint code and find any variances within your car’s paint to get the closest match to the original color. After a test spray of the color to verify, the Liberty Collision team will blend the paint into nearby panels or areas of the car to blend the new and original colors together. You want to make sure the surface area of the car you are treating is clean before you apply any touch ups to the car’s paint. 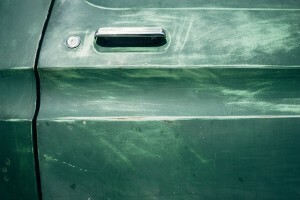 Any dirt, grease, or other residue could mess up your DIY paint job on your car. Avoid this by cleaning out loose debris from a chipped area with tweezers, washing your car with warm and soapy water, and degreasing the area to be painted. Once you have done this, you are ready for your next step of applying layers of paint. A chip in your car’s paint job can lead to rust. If there is rust in the affected area of your car, you will want to take care of the rust problem before painting over it! Assess the extent of any rust damage to see if you may need professional help. For small surface areas, apply CLR to the rusted spot and then clean with Isopropyl Alcohol. These steps will help prevent the spread of rust on your car. To get a cleaner and less obvious repaired look to your car’s paint surface, sand down the edges of the chipped or scratched surface first. Apply a coat of primer and let the layer dry before adding colored paint. 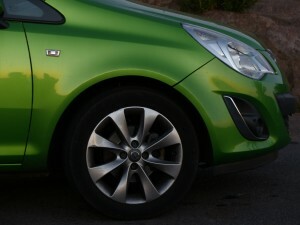 Your next step in repairing your car’s paint surface is to add colored paint. Remember that more layers of thin coats will look much better than one very thick layer. This part mainly takes patience as you wait for each layer to dry. Add clearcoat to seal the surface and allow the newly painted area to cure for about a week before waxing your car. From our garage at Liberty Collision to yours, we wish you the best of luck on your DIY car paint touch up weekend.